Freeze the peach slices on a shallow baking sheet lined with foil or parchment paper. Stir the 1/3 cup sugar into the buttermilk and set aside for a few minutes to dissolve the sugar. 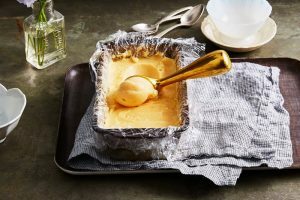 Pour the buttermilk mixture into a foil- or plastic wrap-lined loaf or other shallow pan; cover and freeze until solid. Dump the frozen peach slices into a food processor fitted with the steel blade. Assuming the peaches are rock hard, let them sit for 15 minutes so they are slightly less than rock hard, meanwhile leaving the frozen buttermilk in the freezer. After 15 minutes, remove and cut the frozen buttermilk into chunks the size of ice cubes. Add chunks to the processor and process until the mixture is completely blended and lightened in color. You will need to stop the processor from time to time to scrape the mixture from the side of the bowl or spread and redistribute it to better engage with the processor blades; inspect for lumps of peach when you do this. When the sherbet is smooth and free of lumps, taste and pulse in preserves or additional sugar, to taste, if necessary. Serve the sherbet immediately or scrape it into a container and store in the freezer until needed. Sherbet will retain its scoopable and spoonable texture for 2 or 3 hours before it hardens. Once it’s hard, you will need to soften it for 10 to 20 minutes in the fridge before serving, or zap it for a few seconds at a time in a microwave on defrost. 1. Whisk together the flour, cornmeal, baking powder, sugar, and salt in a large bowl. Dump in the butter cubes. Using a pastry blender, work the butter until you have pea- to lima bean-size pieces. (If you have particularly cold hands, you can use your fingertips.) 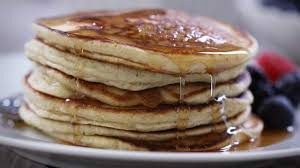 Drizzle in the buttermilk and toss the mixture with a fork until it’s evenly moistened. 2. Plop the dough on a clean work surface. Press and squeeze the dough until it begins to hold together. (If you tossed it well with the fork, this should be a cinch. If you see dry spots, it’s best to use the fork to mix the dough instead of your hands. Whatever you do, don’t overwork the dough.) When all is said and done, you should still see pea-size bits of butter running through the dough. 4. Crank your oven to 350°F (180°C). 5. Toss the cherry tomatoes, olive oil, half the thyme, salt, and pepper in an ovenproof skillet. (I used a 12-inch cast-iron skillet and it worked marvelously.) Cover the skillet and cook on the stovetop over medium-high heat until the tomatoes begin to soften, 2 to 3 minutes. Uncover the skillet and continue cooking until all the tomatoes have burst slightly and released their juices. 6. 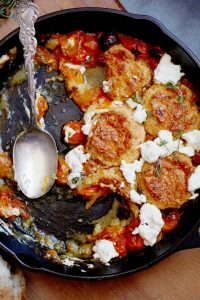 Remove the biscuits from the freezer and generously brush the tops with the egg wash. Place them on top of the tomato mixture in the skillet, spacing them 1 inch (2 1/2 centimeters) apart. 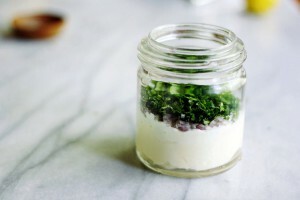 Cover and refrigerate for an hour before using, to allow the flavours to blend and develop. 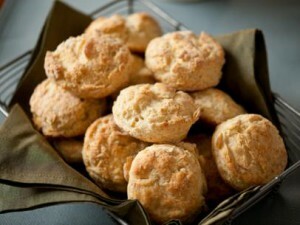 In a food processor, process the corn, buttermilk, and brown sugar just until combined, about 5 seconds. Add the eggs and process to combine, another 5 seconds. You should still have corn lumps. Pour this mixture into the dry ingredients and fold it in with a rubber spatula until barely combined. Add the melted butter and continue folding until the dry ingredients are just barely moistened. Pour the batter into a sprayed or buttered 8×8 glass baking dish, or as I did, a 10-inch cast iron skillet. Bake 25-30 minutes or until it’s a deep golden brown and passes the toothpick test in the center. The cast iron, being dark metal, cooks faster so start checking at 20 minutes. 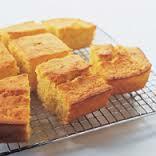 It gives a marvelous crust on top and all around the sides of the cornbread! In spite of the sugar, which made me nervous because I prefer savory rather than sweet bread, the results are perfectly balanced, not too sweet at all. 1. Cook the potatoes in their skins until just tender. Cool, skin, and cut into cubes. 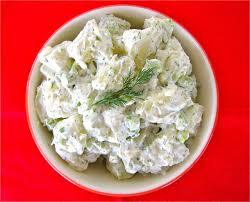 NOTES : This is the potato salad my friends always ask for when we have our annual crab feast. Put cucumbers in colander, salt, let drain 30 minutes, pat dry with paper towel. Mix all ingredients in processor in batches. 1 med head cauliflower, chopped about 5 c.
In a soup pot, combine the onions, garlic, potatoes, celery and water. Bring to a boil, reduce heat and simmer for 10 min. Add the carrots and continue to simmer for 10 more min. Add cauliflower, dill lemon juice, mustard and caraway seeds and simmer for 15-20 min longer until the carrots are tender. 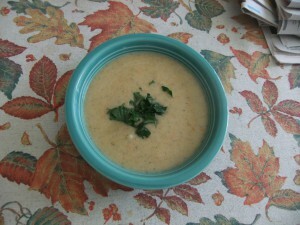 In a blender, or use emersion blender, puree the soup with the buttermilk. Add salt and pepper to taste. Gently reheat. Garnish with scallions. Moosewood Restaurant low-fat favorites.